X-Ray of an eighty year old patient’s foot who wore “pointy-toe high heels” for years. The first questions I always get when I first show patients their x-rays is: what are those two ‘circle things’? Those are bones called ‘sesmoids’ and they are normal and are located under the ball of your first toe joint. 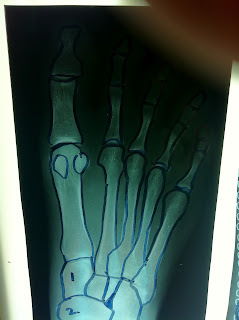 The first x-ray of my foot is me standing barefoot. 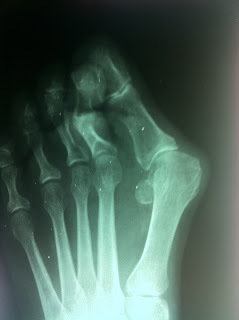 The second x-ray is looking straight down on my foot in a high heel pointy-toe dress shoe. I’ve labelled the ‘medial cunneiform’ bone as #1 and the ‘navicular bone’ as #2, which gives you an appreciation of the angle that the foot in a three inch high heeled shoe. I also cut the second x-ray in the shape of the actual shoe that my foot was in and I outlined the bones on x-ray with a Sharpie pen so that the bones could be more easily visualized. 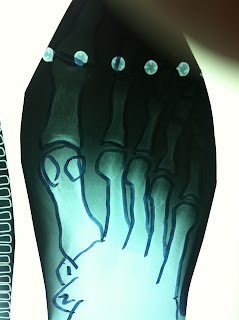 My photos don’t do the x-rays justice but, hopefully, they will give an appreciation of what happens to your toes inside of pointy-toe shoes. I always recommend that if you wear high-heeled shoes – try to find shoes with a wide, soft toebox. Pointy toed shoes can cause hammertoes, bunions, corns, calluses, Morton’s Neuromas and osteoarthritic joint changes that are painful and cosmetically unpleasing. If you are looking for a comfortable high heels – look for a shoe with a thick, rigid wedge sole, rearfoot strapping and, of course, the soft and wide toebox. by using the ‘search’ box at the upper right of the blog.